At the risk of sounding like a ‘Trail Bagger’*, these are some of the recognised trails I’ve backpacked over the years. Darned sure I’ve forgotten a few, and these don’t include a large number of self-devised routes I’ve done. No particular order, each completed in a single go, and mostly solo. * A quick Google search assures me that no such medical condition exists…so why the dodgy right knee? Thinking about walking lejog and am struggling finding info on the cestrains link from Prestatyn to edale…. 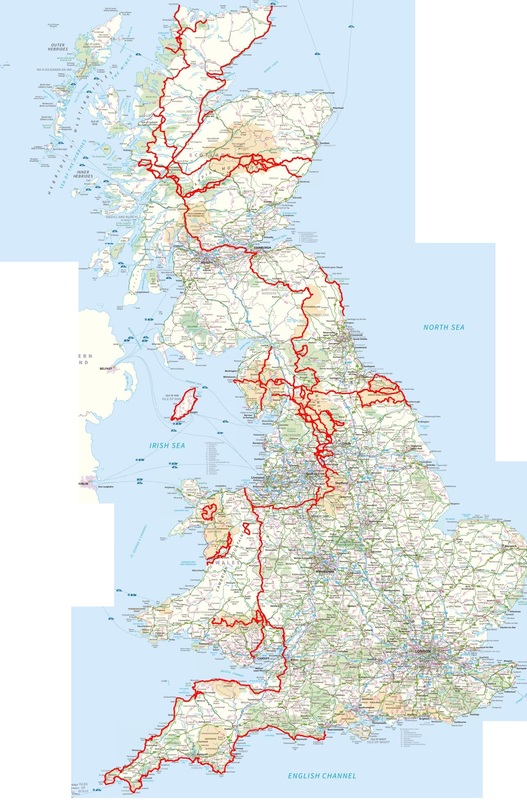 Have you got gpx or info on the route..
Hi Tom, I’m going to have to dig into the grey matter on that one as I walked Lejog almost 32 years ago at the tender age of 18. At the time the Cestrian Link Walk came as a godsend when I came across the book, neatly linking up the Offa’s Dyke to the Pennine Way…which is I suppose the route you are planning? I actually left the Offa’s Dyke around the Ruthin area and cut across a short distance to the Cestrian Link rather than walk Offa’s all the way to Prestatyn. I can’t remember much about the Cestrian Link itself, not because my memory has faded, but because it was one of those link sections that didn’t really have any memorable high points. In fact the only real memory of that section is the large number of fields, styles and gates…..and being attacked by a farm dog and then having to pop into a local school to beg for a tetanus jab. There is a nice canal section, and then climbing up around the area of the Cat and Fiddle gives good views, but other than that it sort of fades in memory, suffering from having a great National Trail at either end of it. Having said that, it did the job, kept me walking away from roads and retained the outdoors feel of the whole trek. So in that sense it’s a useful link. The book for the Cestrian Link has been out of print for some time, and hard to come by. but I still have my copy, and I may in fact also have a GPX file somewhere. I’ll see if I can find the file, but if you need a copy of the book to borrow the let me know, happy to lend it. By the way, you say you will be using viewranger. Will you be printing off maps from viewranger and using the app as a back up? I would strongly advise that you still use printed maps as your main guide. I did the Cambrian Way last summer and my viewranger app got switched on perhaps once or twice along the entire walk, just to get an altitude reading in mist. And as a rule I use 1:50 for coastal walks and any walking in Scotland, but would use 1:25 for sections like Cestrian Link where it’s almost essential to know the field boundary layouts. That’s one thing I suddenly recall from the Cestrian Link, difficulty in finding my way across endless fields at some points when they’re outline is not shown on a 1:50 map.